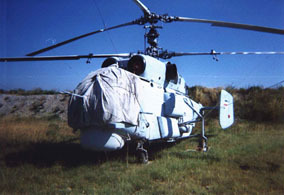 Ka-27PL �Helix-A�: Designed from 1969 as successor to the Ka-25 �Hormone� series and retaining the earlier type�s configuration, the �Helix� first flew in prototype from during December 1974 and has considerably greater power and slightly greater dimensions for much enhanced performance and payload within an airframe still able to fit into the same hangar as the Ka-27. The �Helix-A� is the dedicated ASW variant of the series, and was introduced to service in 1982 with the significant advantage over the �Hormone-A� that it has a hover coupler allowing the dunking sonar to be used at night and in adverse weather conditions. 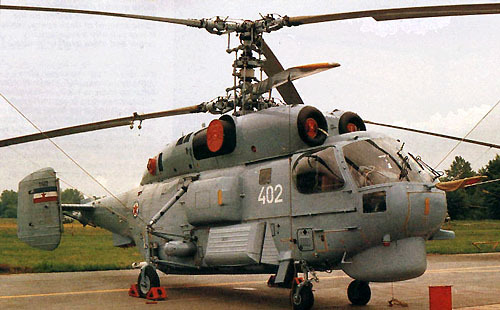 Ka-28 �Helix-A�: This is the export version of the �Helix-A�, powered by two Klimov (Isotov) TV3-117BK turboshafts each rated 1620 kW and supplied with fuel from an internal weight of 3680 kg carried in 12 tanks. The type is presumably delivered with a different (probably lower) avionics standard. 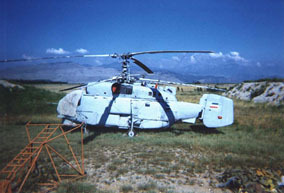 Ka-29TB �Helix-B�: This is the dedicated Naval Infantry assault transport (with accommodation for 16 fully equipped troops) and perhaps more importantly the ability to deliver precision-guided weapons in support of amphibious landings. The type has substantial armor protection for the cockpit and engine bay, and the embarked troops are carried in a hold 4.52 m long, 1.30 m wide and 1.32 m high. Rapid egress is facilitated by the provision on the port side of the fuselage, behind the main landing gear unit, of a door horizontally divided into upward- and downward- opening sections. 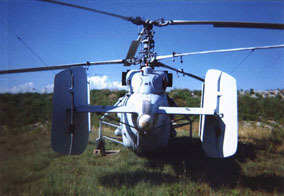 The helicopter�s fixed armament comprises one 7.62 mm rotary four-barrel machine gun on a flexible mounting behind the downward- articulated door on the starboard side of the nose, and one optional 30 mm 2A42 cannon on a fixed mounting on the port side of the fuselage; the disposable armament is carried on four hardpoints under braced outriggers, and comprises four-round launchers for AT-6 �Spiral� anti- tank missiles or UV-32-57 multiple launchers each carrying 55 mm unguided rockets. This variant�s standard electronics include optronic and missile- guidance pods under the nose, an ESM system with its antenna above the rear part of the engine bay forward of the IR jammer, and an RWR. There is also an EW version of the �Helix-B� thought to be optimized for the AEW or jamming role with equipment in three panniers under the fuselage and on its sides, and in an extended tailcone. The other main differences between the �Helix-A� and �Helix-B� include the latter�s powerplant of two Klimov (Isotov) TV3-117VK turboschafts each rated at 1660 kW, wheel base of 3.00 m, basic empty weight of 5520 kg, maximum level speed �clean� of 265 km/h at sea level, and range of 520 km with standard fuel. 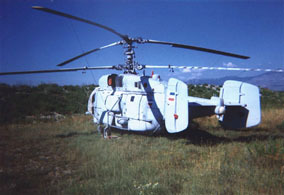 The NATO reporting name �Helix-C� has been given to the Ka-32 civil helicopter which can carry a planeload of 5000 kg over a range of 180 km. 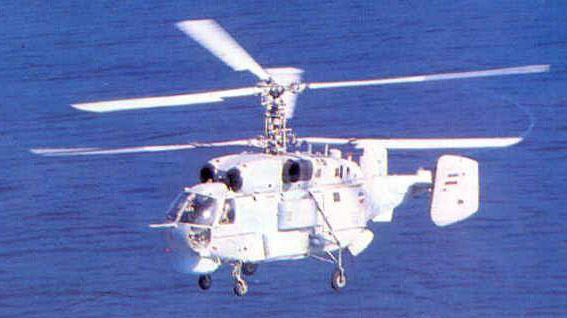 Ka-27PS �Helix-D�: this is the general- purpose member of the Ka-27 series that can be used in roles as diverse as SAR, planeguard and under- way replenishment of warships at sea. Thought based on the �Helix-A�, the type has the two external fuel tanks of the �Helix-C� and is fitted as standard with a rescue hoist.